October, 2007 - Valley of Fire State Park outside Las Vegas is gorgeous with a stunning road that snakes past all kinds of exotic red rock formations. and spent a week in Valley of Fire State Park. This park is truly on fire. spectacular sights at every turn. The park features a wall filled with petroglyphs. far out of human reach. evenings we watched the bats chase the bugs around the restrooms. After many attempts, Mark caught one mid-flight. away as the sky flamed from deep orange to soft peach hues. a little west, dropping into Death Valley National Park in California. This entry was posted in Nevada and tagged Nevada, Shutterbug, Travel, USA by Roads Less Traveled. Bookmark the permalink. So easy! This is an ideal combo to raise and lower trailer stabilizing jacks without cranking: a cordless drill and a special 3/4" socket. We use an 8" extension too. 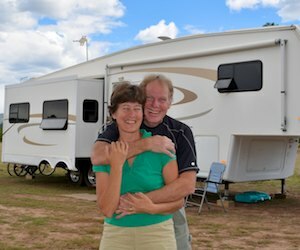 For more info visit: RV Tips & Tricks!